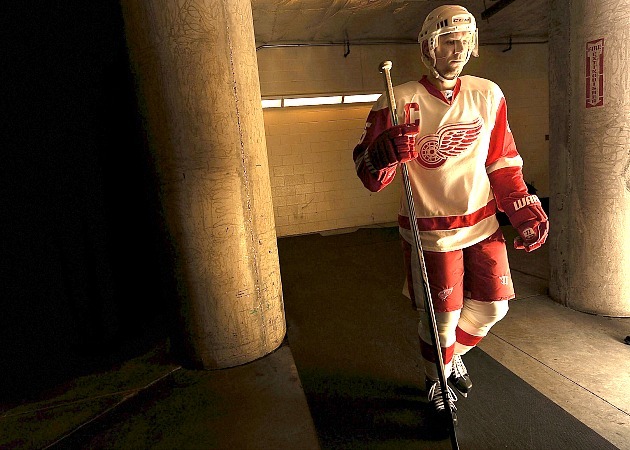 Newly minted 2015 Hockey Hall of Famer Nicklas Lidstrom was the NHL’s perfect player: a 2008 Sports Illustrated feature story by Michael Farber. This story originally appeared in the January 28, 2008 issue of Sports Illustrated. Subscribe to SI magazine here. Special Championship Offer: Get a Commemorative Chicago Blackhawks book and framed cover. There is a laughably misguided notion that just because Nicklas Lidstrom is the best player on the NHL’s best team, leads all defensemen in scoring, is the league’s top plus-minus player, has won five of the past six Norris Trophies, has missed only 22 games in more than 15 seasons, rarely takes penalties despite playing more than 27 minutes per game and keeps his locker obsessively neat in an otherwise Delta House dressing room that he is perfect or something. Yet sometimes, perhaps as frequently as Halley’s Comet or a believable performance by Keanu Reeves, Lidstrom does err. After the 1–0 Red Wings victory, Colorado winger Andrew Brunette, who was on the ice at the time of Lidstrom’s errant pass, denied that the Avalanche had engaged in any gamesmanship. (Although, when the player with the NHL’s highest hockey IQ remarks on your savvy, you should take it as a compliment, deserved or not.) Lidstrom’s gaffe, meanwhile, became a topic of postgame discussion in the Red Wings coaches’ room. The Red Wings trashed the idea of NHL parity by winning 30 of 41 games in the first half, the best mark since the league adopted an 82-game schedule before the 1995-96 season. They were 35-10-4 through Sunday, a cushy 13 points ahead of the Dallas Stars, who had the second-best record in the Western Conference. “This team is playing just as good defensively as the one in 2002,” says Lidstrom, 37, who won the Conn Smythe Trophy that spring for helping Detroit to its third Stanley Cup in six years. “That team had more talent up front with all the high-profile players, but this team can have just as much success with the way we're playing now.” The Red Wings lead the NHL in goal differential, goals against, shots, shots against and face-off percentage, so their first-half MVP was: a) left wing Henrik Zetterberg; or b) goaltender Chris Osgood. Or so some said. The Red Wings’ beat writer for The Detroit News named Zetterberg, who at the midpoint of the season led the team with 25 goals and 52 points. At the same time, a fan poll on Fox Sports Net Detroit overwhelmingly favored Osgood, who was 18-2-1 with a 1.71 goals-against average and a .931 save percentage while splitting the job with Dominik Hasek. That Lidstrom, who is merely having another immaculate season and is on pace for his standard 60-plus points, was not deemed most valuable may be because he is among the Red Wings’ least voluble—a lead-by-example captain who rarely raises his voice in the locker room. “For me, Nick’s the MVP of the league,” Detroit coach Mike Babcock says. “Since I got here [in 2005], every one of his defense partners, [Mathieu] Schneider, [Andreas] Lilja, [Danny] Markov, now Rafalski, has had a career year. How can you not? Other defensemen have some dimensions to their games, but Nick has all the dimensions. The only thing he doesn’t do is cross-check you in the face, so he doesn’t take penalties. He’s on the ice all the time." Like the elements of modern Swedish design, Lidstrom’s game is all clean lines and efficiency, nothing ornate like a Bobby Orr end-to-end rush or a Scott Stevens open-ice hit. “Stevens had as many in a game as I might have in a season,” says Lidstrom, who ranked 514th in the NHL in hits. There is no better exemplar of modern, sanitized hockey than a player who arrives at the arena wearing suits that have fewer wrinkles than a freshly Botoxed face and who, after a game, hangs up his own pants, lays his two sets of gloves on the top shelf of his stall and places foam pads from his skates side by side in the far left corner of the lower shelf. If you like his locker, Babcock enthuses, you’ll love how precisely he tapes the knob of his stick. 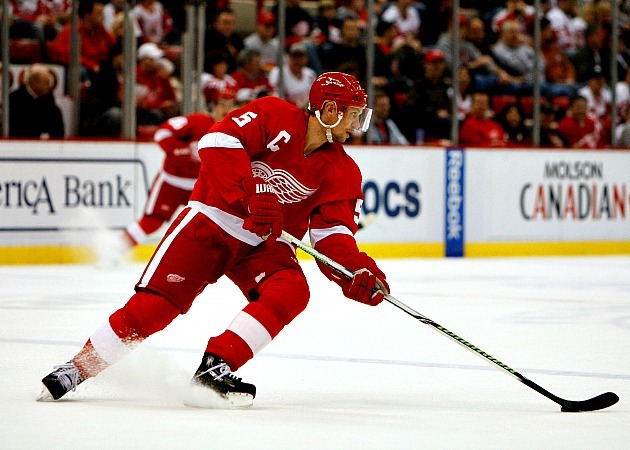 With his seemingly effortless approach Lidstrom can seem invisible. Even in Sweden. He scored the gold-medal-winning goal in the 2006 Olympics, but perpetually injured Peter Forsberg and Toronto Maple Leafs captain Mats Sundin, both forwards with less subtle on-ice skill, have higher profiles at home. Still the sheer weight of Lidstrom’s accomplishments will eventually define his place among the greats. In addition to finishing first or second in Norris Trophy balloting in eight of the past nine seasons, he is a staggering +375 in his career. Potvin calls Lidstrom the ultimate chess player on ice. Detroit’s mockery of the regular season has turned their final 33 games into a dress rehearsal, an extended audition for Osgood and Hasek (16-7-2, 2.16 goals against average) to determine the Game 1 playoff starter and for Zetterberg and Pavel Datsyuk to pad some already formidable numbers. Despite the Red Wings’ extraordinary season, their depth of weapons (they were the only Western Conference team to have five players with 14 or more goals) and the probability that they will secure the conference’s No. 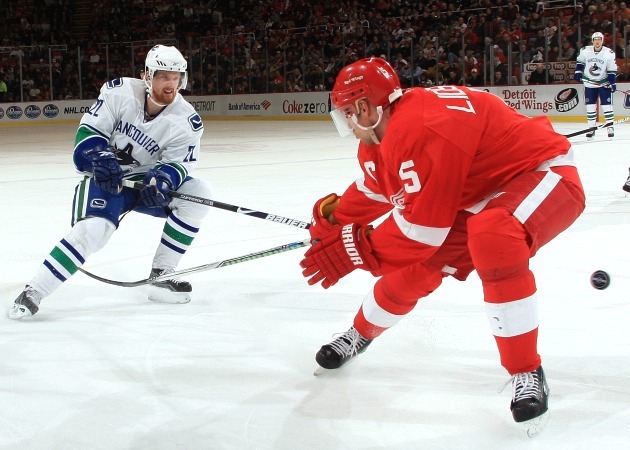 1 seed, Lidstrom and the Red Wings are not guaranteed an easy ride in the playoffs. The San Jose Sharks, SI’s preseason Cup pick and a team that wins with panache away from home, loom, as do the dangerous defending champion Anaheim Ducks, who got a significant boost with the Dec. 16 return of Scott Niedermayer, the NHL’s second-best defenseman. If there is a valid criticism of Lidstrom—and the fact that he neither skates as wondrously as Niedermayer does, nor crushes unsuspecting forwards in the manner of the Calgary Flames’ Dion Phaneuf, is hardly important—it is this: Despite his Conn Smythe, Lidstrom hasn’t noticeably raised his game in the playoffs. A typical Lidstrom match on May 10 looks like a typical Lidstrom match on Jan. 10; flatlining at an elite level is fine, but the caveat is that almost everyone on the other team has lifted his game. So although it is only January, the defining issue for Detroit is whether Mr. (Almost) Perfect can take a Swede-heavy roster to the Red Wings’ 11th championship and become the first player born and trained in Europe to captain a Stanley Cup winner. It would go down in history as the bland leading the blonds.